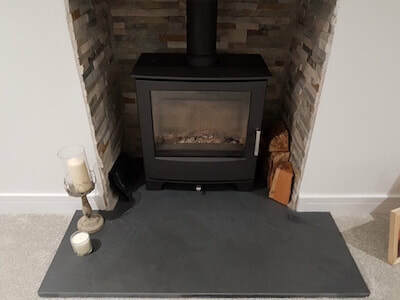 Are you looking to buy a slate hearth stone in Northern Ireland then you have come to the right place we can cut bespoke shaped natural stone slate in a large variety of sizes and thickness's as well as different shapes such as square, rectangular, circles, teardrops and Single one piece T shape which are very popular if you want to place your log burner inside your chimney breast. We offer a quick cutting and delivery service to Northern Ireland for all your slate hearth requirements. All of our slate is imported from Brazil and can be used for Wood burners , electric or gas fires.